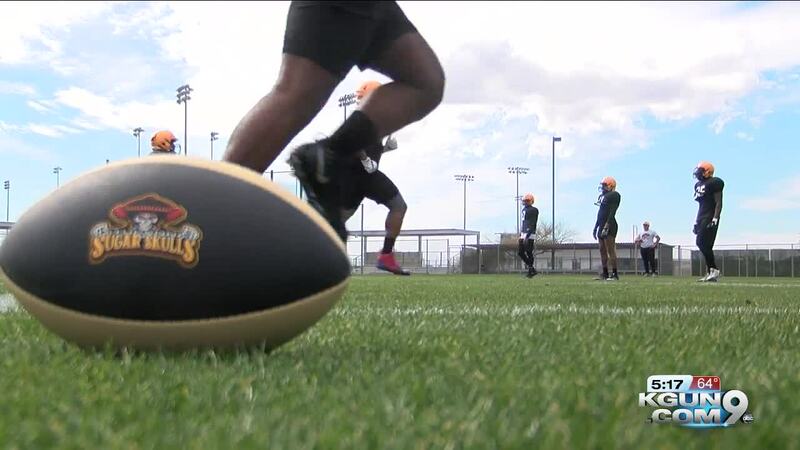 TUCSON, Ariz — Tucson's first professional football team held its first practice today outside Kino Stadium. The Tucson Sugar Skulls are an expansion team in the Indoor Football League. They will play a fourteen game schedule beginning in March with their games at the Tucson Arena. The Sugar Skulls are coaches by Marcus Coleman, who comes over from the IFL champion Iowa Barnstormers where he was their defensive coordinator. "We're going to be mentally tough, first and foremost," said head coach Marcus Coleman. "We're going to be physical, and we're going to play fast on offense and defense. We're going to be an attacking style team on both side of the ball. " "I already knew coming in we were going to be good on defense," said quarterback Bryan Hicks. "We've got a great defensive coach. We've got some great guys. They were rolling, and we should expect a lot from them. " One position that players aren't trying out for is punter, as there is no punting in the Indoor Football League.